JungleWatch: WE ARE GOING TO FIND IT! WE ARE GOING TO FIND IT! In our last post on this, we covered quite a bit of information and several documents. Each document lends itself to many questions. And since none of the people involved in this mess are willing to answer any of them, we'll ask and answer some of them ourselves. 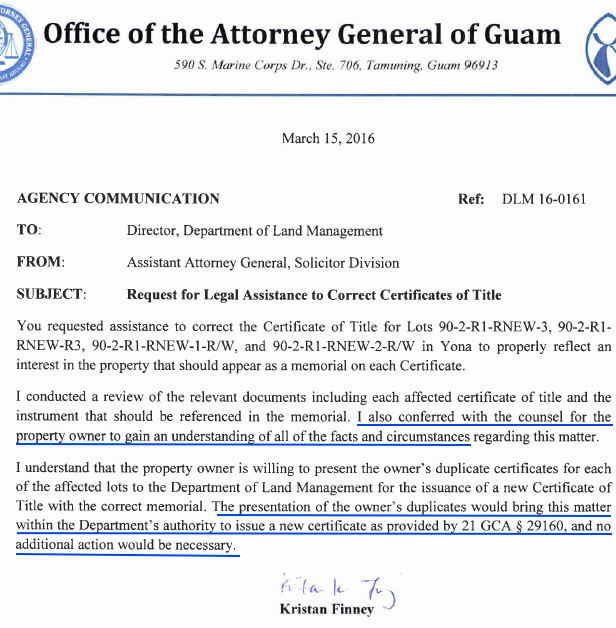 First let us compare these two letters from Kristan Finney, Assistant Attorney General and the legal counsel to Michael Borja, Director of Land Management. On January 6, 2016. Atty. Finney advises Borja that the "only other way" (besides a name change) "the law provides to correct a mistake" is to "apply by petition to the court." 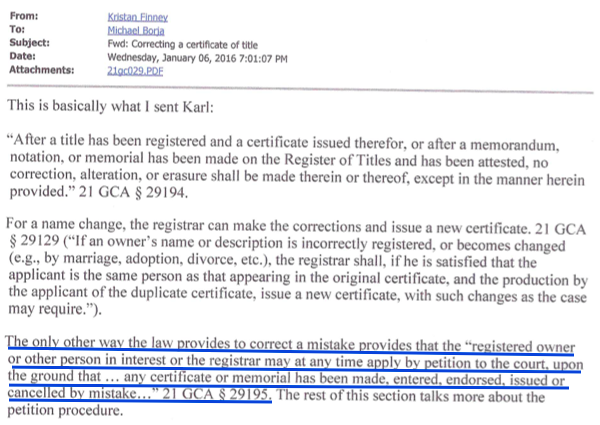 Two month later on March 15, 2016, the same Attorney Finney advises Borja that the property owner only needs to "present the owner’s duplicate certificates for the issuance of a new certificate" with the correction. No explanation is given why her previous counsel does not apply. There is no quote referenced from § 29160 justifiying the cancellation of the previously issued certificates. There is...well, NOTHING. It's simply a brand new opinion and does not even reference the first. The turnabout is so unreal, so "un-legal-like," so beyond what we believe we can expect from the office of Guam's chief legal officer, that, given Finney et al's lack of information, we are forced to fill in the blank ourselves. Over the last few years we have become quite used to "filling in the blank ourselves" because the same cloud of secrecy and absolute "180's" after revealing lie after lie after chancery lie is the same cloud of secrecy and "absolute 180's" we are now seeing in the Government of Guam, all the way up to the highest level of law enforcement. This is pretty damn scary. Annulments. Annulments are a big deal. Without one a married and divorced Catholic cannot marry another. To get one, the annulment process must pass through the local Tribunal. David the Villain provides over this Tribunal and Brother Tony himself, though he doesn't sit on the Tribunal, is officially the final judge. Obviously anyone hoping to get an annulment does not want to run afoul of David the Villain or Brother Tony. And due to Guam's close family connections, if one has a relative pending an annulment, the family may force someone into silence. I personally know of three situations where this fear has played a role in silencing individuals who otherwise might have influence. Sacraments. Sadly, we also have to suspect whether or not the threat of withholding sacraments is also at play here. To be sure, the threat is probably never explicit. But given the general attitude of deference to the clergy on Guam, there is probably real fear that if one speaks out or does not do the will of the Kiko's, that access to the sacraments could be made more difficult. This is especially true in the case of baptisms where even non-Kiko priests have posed unnecessary road blocks to the baptism of newborns unless the parents do this or do that. Catholic schools. We have stories where even access to a Catholic school is a factor. There is fear that if one speaks up it may be harder to get one's child into a Catholic school, or it could put a child's current enrollment at risk. There is also some evidence that tuition could be lessened or even done away with if one plays a critical role in supporting the Kiko's. Funerals. We have already seen the difficulties the Kiko priests have imposed on funerals and burials. Some of this is due to their being members of a different religion, one which worships only on Saturday - thus the "no funerals on Saturday" rule or at least after a certain hour - since that is when their Holy Day begins. However, exceptions are made and Kikos and Kiko-friendly parishioners are accommodated where others are even forced to find another parish and a different priest to bury their dead. Access. Then of course there is access, access to the Kiko's inner circle. Having the bishop in your pocket makes it easy for the Kikos to reward "helpers" (in government offices or otherwise) with access, access to parties, special events, or to specific "assistance" within the chancery itself. Money. Under the guise of "community" there is a lot of money floating around to supposedly "assist the brothers." Once you take money - especially in a time of need - you owe something. And the Kikos know how to use this. It is their MO. Buying influence under the guise of "helping" is how they've got to the highest halls of power. How much more so are they adept at using money under the same guise to buy control of "helpful" people. We don't know what caused Kristan Finney to do a 180 between January 6 and March 15. But we do know that she "had to work something out" with Jackie Terlaje. BTW, isn't it interesting that when referencing Jackie the Trained lawyer, both Finney and Barrett-Anderson never use her name. They only reference her as the "legal counsel" for the title holder. There's a reason. And WE ARE GOING TO FIND IT. On annulments aside from the two mentioned above, I do believe that Adrian acts as the devil's advocate in the process. As for funerals, um, one has to attend a Kiko funeral from beginning to end to know what is hapenning. Make sure though that you bring your dancing shoes! And just imagine if an island journalist was seeking an annulment. Would that affect his/her ability to investigate and report the truth about the local Catholic Church's shenanigans? Or even not want to talk or write about it. Thank-you for inadvertently answering a question I have pondered for over a year. I kept wondering why so few people put their name to posts on this blog. It is a sea of anonymous with only a handful signing their names. I thought perhaps it was a cultural thing on the island, but with time, as more and more people got disgruntled, and desired to have their voice heard, they would start signing their names. I never thought about the fear and ramifications involved in signing one’s name on a small island. All the things a Catholic takes for granted within his church, could be jeopardized by signing a name on a blog the Archbishop and his assistants detest. So sad! He has suppressed the voice of his people. Interesting that Finney says she meet with the title holder and came to an agreement. But what if the title is contested? What if tomorrow we got a new Archbishop, a real Archbishop, and as the "title holder" he decided to demolish the building and use it as a tent city seminary? That would be within his right to do, while still honoring the "in perpetuity deed restriction". And what if at that point the real property owner, the RMS Seminary corporation they said, "hey, read the document new Archbishop. You don't own this property. It clearly says in the document that Archbishop Anthony gave the property to us. The document says "...the owner hereby covenants and declares that the Property is and shall be held, used, transferred, sold and conveyed...". The RMS corporation could then petition DLM to record them as the lawful owner. What could the new Archbishop do? Finney says she has worked with the owner, the Archdiocese, but she doesn't even know if the Archdiocese is still the real owner. Maybe that's why some smart senator wrote the law to have the court look at all the facts. Instead, some punk junior grade attorney at the AGs office assumed the Archdiocese was the owner without the benefit of a smart judge to review her oversight. And if a smart judge ruled that the language of the deed did not transfer the property to RMS, then at least a new Archbishop could have the boys in Yona living in a tent city. Better yet, a new Archbishop could take away the RMS privileges/rights to act as a seminary on Guam. They leave and we get our property back to use however we want. The AG really screwed us over by omitting court review. How many other properties have been lost because of this poor attitude by the AGs office? Qatar checks in to see what's up. extortion. protection schemes. racketeering. 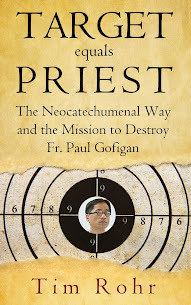 reads like a novel about organized crime, but in the ecclesial order. 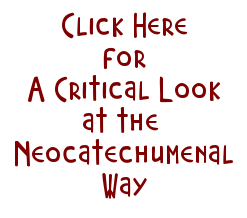 the denial of the sacraments and of a proper Christian burial are two things i would expect the remaining non-neocat clergy to be able to do something about. but if they themselves are as fearful as the laypeople, can we call it a lost cause? in any case, i hope it's clear to everyone that this current sad state of affairs can only be resolved with the work of saints and martyrs--that is, people of heroic virtue who are willing to sacrifice position, prestige, even family ties, to do what's right. Well said Red, but it is more than just in the ecclesial side of the equation. Organized crime is a fairly accurate description. When you consider the checkered past of the Genarinni Brothers, their network of corruption, and influence. Their Italian, Sicilian Maltese contacts, and privileged access to certain Italian communities in New Jersey, nothing is surprising. When you add to this, the sophisticated schemes of money laundering they have put in place, thanks in part to their RMS network, ( a great coverup, if any), but also with their network web of neo related business ventures, with dubious billing practices, tax evading measures, and kick backs; you fall exactly into the legal definition of organized crime. This is genial, because it uses religion as a coverup, which makes it extremely sensitive for any investigator to take the risk of doing their work. Finally the general use of clerics with suspicious past, to whom they extend protection, gives them a pool of priests, and bishops that are not too regarding, about what is required, by their sponsors, and whom they know are already of dubious character, therefore very willing to help. This is what you might call a perfect storm. UPDATE. Received another confirmation that membership in ncw is fast track to annulment. Wow, fast track presbyters and fast track annulment, AND they promise fast track to heaven! Those sneaky Neo devils have it all covered. Oh, don't forget to donate lots of money and all your worldly possessions because you can't take them with you when you die. JOY!